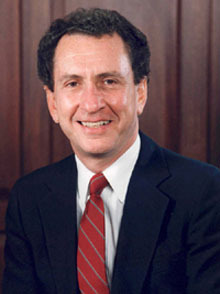 When Arlen Specter was a young lawyer, he was appointed as assistant counsel to the Warren Commission, the government body investigating the assassination of President John F. Kennedy. There was only one way the evidence could show that Lee Harvey Oswald had acted alone in killing Kennedy, and that was Specter's "magic bullet" theory. In short, Specter's theory was that one bullet, fired from Oswald's gun on the sixth floor of the Texas School Book Depository Building, hit Kennedy in the back, then ricocheted up and exited from the front of Kennedy's throat, then entered Texas Governor John Connally's back, shattering five inches of his rib bone, then exited through Connally's chest and struck his right wrist, shattering the radius bone, and then embedded itself in Connally's thigh. If Oswald had no accomplices, then this bullet would have to be the same bullet that subsequently loosened itself and fell out of Connally's body as he lay in a stretcher on the way to the hospital. And that bullet was pristine, as unsmudged and undented as a bullet that had never been fired. This was Arlen Specter's theory. It proved conclusively that Oswald acted alone, and that there was no conspiracy to kill Kennedy. At the time, Specter was a registered Democrat, and he had been friendly with John and Robert F. Kennedy. But a few months after the Warren Commission announced its findings, he switched parties, and ran for District Attorney of Philadelphia as a Republican. He won, and held that job for eight years, then worked as a lawyer until he was elected to the U.S. Senate in 1980, where sat for the next three decades. Generally a fiscal/economic conservative and social moderate, he wrote the Armed Career Criminal Act, which has meant long prison terms for criminals who repeatedly use guns in their crimes. He also wrote the Terrorist Prosecution Act, which gives U.S. courts jurisdiction in cases of terrorism against Americans, no matter where the terrorism takes place. Specter's cross-examination of Anita Hill made great television, during the hearings on Clarence Thomas's appointment to the Supreme Court — she had accused Thomas of sexual harassment, but Specter clearly did not believe it. Specter ran for President in 1995, but his candidacy fizzled fast. In 1998, he wrote an essay stretching more than 14,000 words arguing that President Bill Clinton should not be impeached. In other key votes, Specter supported the 1990 Americans with Disabilities Act, 1991 Gulf War resolution, 1993 North American Free Trade Agreement (NAFTA), 1997 McCain-Feingold Campaign Finance Reform, 2001 USA PATRIOT Act, 2002 Iraq War resolution, 2004 restriction to bankruptcy rules, 2006 Secure Fence Act, 2008 Wall Street bailout, 2009 economic stimulus, and 2010 health care reform. He opposed the 2005 Central American Free Trade Agreement (CAFTA). In 2009, he switched parties and announced that he would run for re-election the following year as a Democrat, explaining in an interview that switching parties would help him get re-elected, as he expected a likely primary challenge from right-wing Republican Pat Toomey. Newly-minted as a Democrat, Specter was embraced by President Barack Obama and the Democratic Party's establishment, but lost the 2010 Democratic Primary to two-term Democratic Congressman Joe Sestak, and was succeeded in the Senate by Toomey. Specter died of lymphatic cancer in 2012. Specter is peripherally connected to the infamous Unicorn Killer, Ira Einhorn, who bludgeoned his girlfriend to death in 1977, then left her corpse to rot in a trunk in his closet. In 1981, it was Specter's secretary who signed for Einhorn's $40,000 bail. Einhorn promptly fled the country, and disappeared. He was tried in absentia in 1993, found guilty, discovered in France seven years later, and now resides in a Pennsylvania prison. Switched from Republican to Democratic on April 28, 2009; Specter was previously a Democrat from approximately 1948 to 1965.